After countless Leaks, rumors and hints Xiaomi has officially launched their flagship Mi5 smartphone through a special event in China. The phone was also showcased at Mobile World Congress 2016, marking it as their first major MWC appearance. The 5.15 smartphone goes in competition with other flagship phones but this one budget smartphone winner itself. This time for the Xiaomi Mi5, we have the fingerprint scanner and hardware button on the device. It gets the power of trusted and powerful Snapdragon 820 chipset by Qualcomm and it’s one of the most powerful phone till date and it achieved good score in benchmark. 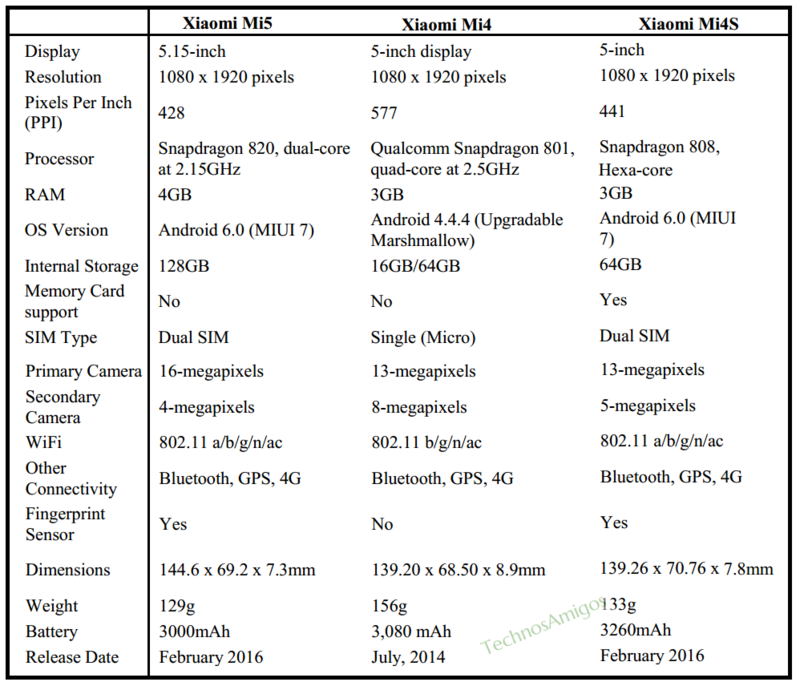 In this post we have compared Mi5 with Mi 4 and also included Mi4S in the comparison as well. The Mi4S was other handset Xiaomi announced the same day. While possessing different screen size, all the three phone provides full HD resolution but there is difference in pixel density. The Mi5 goes with latest Snapdragon 820 chipset while the Mi 4 is with Snapdragon 801 and Mi4S goes with Snapdragon 808, clocked at different frequencies. The Mi5 only has 4 GB of RAM while other two have 3 Gigs of RAM. So are you looking forward to buy Xiaomi Mi 5 or Xiaomi Mi 4S?